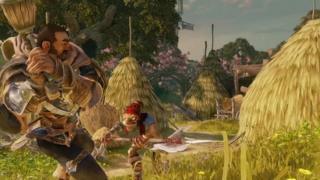 Microsoft is proposing to shut the British video game studio behind the classic Fable series, the firm has announced. The latest instalment, Fable Legends, had been in development at Lionhead Studios for more than two years and was due to be released in the spring. Work on it will now cease, the firm said in a blog post. The studio was founded by Peter Molyneux in 1996 and was bought by Microsoft ten years later. Press Play Studios in Denmark, which created Max: the Curse of Brotherhood and Kalimba, will also be closed. "These have been tough decisions and we have not made them lightly," wrote Hanno Lemke, general manager of Microsoft Studios Europe. "We have nothing but heartfelt thanks for the members of Lionhead and Press Play for their contributions to Xbox and gaming," he added. James Batchelor, editor of Develop magazine, told the BBC the closure of Lionhead would be a blow for the UK video gaming industry. "It's a fantastic studio," he said. "One that really shows a proper British sense of humour in its games - lots of talented people work there." But he said that deciding to halt a game like Fable Legends after so long in development is not that uncommon. "It happens - sometimes for some reason [a studio] can't make it the hit they want it to be. That's the risk of development, particularly when you openly announce a game and raise expectations." A year ago Fable Legends was being described by Microsoft as its 'hero title' for gaming on Windows 10. There'd be full cross-platform support, Xbox Live integration, and cross-play. But that's come to a very abrupt end with the shuttering of Lionhead Studios. And games studios never close; they are, in the language of the industry, shuttered. Molyneux is one of the most interesting, and divisive, figures in the UK's games industry. Depending on your point of view he was either a visionary who helped create wonderful, innovative games or a showman whose ambitions never quite came to fruition. What is certain is that in the final assessment Lionhead will be seen as a great seedbed for British talent and that this is a sad moment for the UK industry. However, we'll just have to hope that the adage that two studios spring up when one closes holds true. The news soon began to trend on social media. "So sad to hear about Lionhead - that's another little bit of gaming history gone," tweeted Eurogamer's Aoife Wilson. "Lionhead studios have shaped my life and I'm really not prepared for them to close," added Thom_AFC. "This is a sad day for Lionhead, the Guildford Studio cluster and for the wider UK video games industry," said Dr Richard Wilson, chief executive of video games industry body Tiga. "Lionhead's talented development workforce has made some hugely successful and iconic games over the last 20 years including Black & White and the Fable franchise. "We hope that the Lionhead team will find new work with other developers or set up new studios to repeat Lionhead's successes."